Former Cebu City Assistant Prosecutor Mary Ann Castro, linked to some legal knock-down-drag-out for more than three years, has been shot dead, prompting the Department of Justice to order an in-depth investigation of the murder. Police said the 49-year-old Castro, who faced an administrative complaint before the Office of the Ombudsman-Visayas for immorality and grave misconduct for having an extramatial affair in 2002, was shot dead by an unidentified man on a motorcycle at 9.53 Thursday night. No suspect has thus far been arrested by law enforcement agents. But Justice Secretary Menardo Guevarra has ordered the National Bureau of Investigation to probe the circumstances surrounding Castro’s assassination. “I have immediately directed the NBI to investigate the ambush of Prosecutor Mary Ann Castro and to identify the perpetrators at the soonest possible time,” Guevarra said in a text message to reporters. This developed as lawyers groups including the Manila-based Integrated Bar of the Philippines and the National Union of Peoples’ Lawyers separately expressed alarm over the surge in the murder of members of the legal profession. According to IBP, at least one lawyer is killed per month since August 2016. At the same time, data from NUPL showed that excluding judges and prosecutors, there are already 24 lawyers killed in two years. 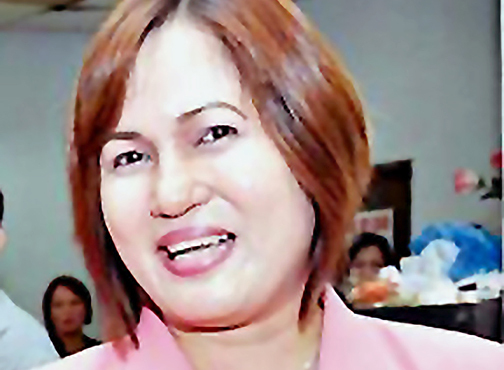 Police said Castro, who was assistant prosecutor for 18 years–she resigned on April 1, 2017 after being suspended twice and left two children–was driving a yellow Nissan Juke car towards the Capitol area from the Cebu Business Park in the city center when she was gunned down by the suspect who drove his motorcycle close to the driver’s side of Castro’s car. Her car swerved to the opposite lane and crashed against the perimeter fence of a construction site. Official sources said the Supreme Court suspended Castro for six months and a day in June 2015 for wielding “excessive influence” when she asked the police to help her brother who complained about a defective vehicle he bought in 2001. The sources said Castro was again suspended in 2016. This time, the high court’s Third Division suspended Castro for six months for filing separate petitions for annulment of marriage in two trial courts in Cebu in 2000. The high court lifted Castro’s suspension and reinstated her to the practice of law effective January 2017. According to court records, in March 2016, while serving her suspension imposed by the Supreme Court in 2015, she began work as acting chief of the Talisay City Legal Office. At the same time, Castro’s involvement in extramarital affairs was easy fodder for tabloids in the city. Records suggested that in August 2002, Cherry Basalo Augusto filed an administrative complaint before the Office of the Ombudsman-Visayas for immorality and grave misconduct against Castro for having an extra-marital affair with her husband, Zandro Augusto. Cherry claimed she had seen the pair in a motel in Mandaue City on Aug. 11, 2002. But two months later, on Oct. 3, Cherry was shot in the head allegedly by PO1 Clementino Dulguime Jr., who subsequently shot himself with the same gun. Observers said the NBI would have to do good spadework to uncover all the official and personal flack.